December 2018 – Industrial lands were a hot topic at the November 19 Planning Commission Meeting. Trends and changes in the industrial market are an indicator of how the industrial market plays into economic development areawide. 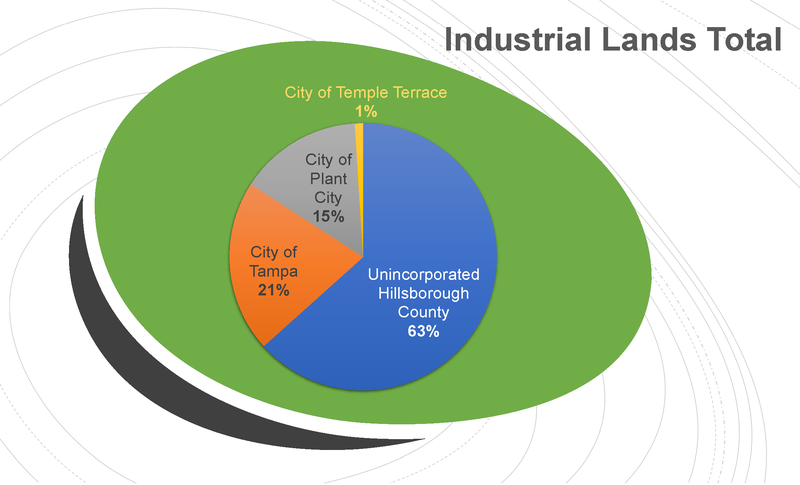 Today, 64% of industrial land holdings are in Unincorporated Hillsborough County. The City of Tampa and Plant City hold 21% and 15% of industrial lands respectively. Temple Terrace recently created this land use category in 2015, with only 85 acres accounting for less than 1% of industrial lands countywide. Staff presented data and preliminary findings on industrial land changes between 2008 and 2018. Over the ten year period, about 17% of proposed Plan Amendment applications Countywide have been associated with either an increase or decrease of industrial lands. Through analyzing Plan Amendment data, staff discovered the City of Tampa had not received a single request to convert lands to an industrial classification over the past decade. Conversely, Plant City reviewed 12 requests and unincorporated Hillsborough County had ten.